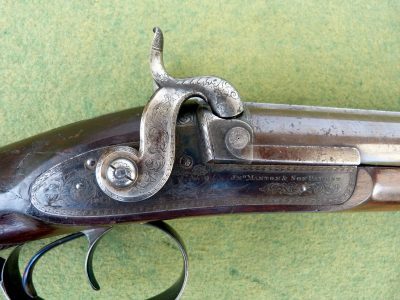 Each gun with 30 inch sighted rebrowned twist barrels engraved “John Manton and Son Dover Street” on the elevated top rib, the breech and tang engraved with foliage surrounding a pheasant, locks finely engraved with scrolling foliage surrounding three pheasants and signed “JNO MANTON & SON PATENT”, hammers engraved en suite, figured walnut half stock finely chequered at the wrist, blued steel furniture decorated with more engraved foliage and game scenes, pineapple finials to the trigger plate and ramrod entry pipe, original brass mounted ebony ramrod with capped charge extraction screw. London proof marks. In their original two tiered brass mounted mahogany case lined in green baize with accessories including a pair of leather covered powder flasks and a pair of leather shot flasks, the interior of the lid with makers trade label, the exterior with circular carrying handle.